Growing up in the pre-GPS era, Joe Inabinett navigated to towns outside his Washington D.C. home relying on his road atlas. He’d study the giant paper pages, decoding the narrow, crisscrossing slivers of roadways as he plotted his way somewhere new. Still, he had no idea where—and on what type of adventure—his early interest in maps would eventually lead. Inabinett studied film and business at George Mason University, in nearby Fairfax, Virginia, where he also met his future wife, Karly, an economics major. The couple married in 2011 and, in those first years out of college, moved often for Inabinett’s career in film and broadcast television. The work was interesting, though mentally difficult. Inabinett spent half a year creating a documentary for PBS that, he says, “never saw the light of day.” After that, he sold a reality TV show to MTV that sat on the shelf for years. He wrote pilots for Amazon Studios that got optioned, but never went further. “Basically, I got tired of having my passion projects squashed by the long waiting game of the industry,” he says. His work brought the couple to Rocklin, California, in 2011. Inabinett worked a stint in radio and spent the majority of 2013 working for Disney on developing a kids’ iOS app. “Then, in March 2014, Disney laid off most of its gaming division and the project died,” Inabinett says. For a brief period, there was talk the project would be resurrected as part of the Ted 2 movie, starring Mark Wahlberg, but when the reviews started coming in, the studio decided the movie didn’t need a companion game app. At that point, Inabinett had years of experience as a television producer, graphic designer and serial entrepreneur. “All those experiences led to me learning how to perfect a new craft into something that’s artsy and marketable,” he says. 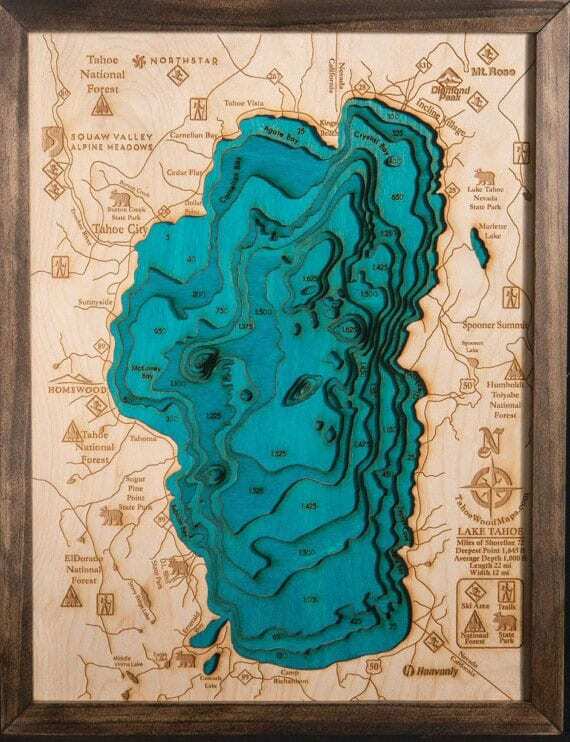 Using birch wood and laser-cutting techniques, Inabinett created three-dimensional map carvings of Lake Tahoe and Folsom Lake. He made about two dozen maps and entered them in the annual winter art show at Rocklin’s Sierra College as part of what he called a “test run” before he and Karly left town for the holidays. They returned and were surprised to find that every one of the maps had sold. The success at the art show solidified Inabinett’s decision to turn mapmaking into a career. Working under the business name Origin Artwork, maps would once again guide Inabinett to a new destination. Each map takes three to five weeks of pre-work before moving into actual production. 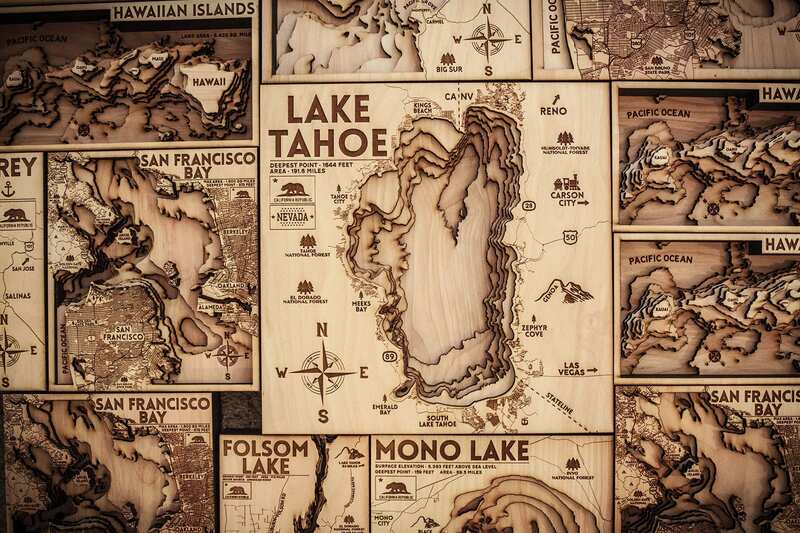 For a map like Lake Tahoe, these weeks of study translate into a wooden representation of The Lake’s contours, complete with coves and bays. Layers of birch wood depict water depths, whether through the drastic drops of the West and East Shores, or the more gradual grading of the South and North Shores. Images of towns, forests and roadways are seared into the wood, adding to the sense of scale and place. Today, Inabinett works from the 1,200-square-foot workshop at his home in Foresthill, on the outskirts of Tahoe National Forest. His maps are made mostly with birch, though he’ll occasionally use oak, spruce or fir for a darker contrast. Once the wood is cut, Inabinett sears its edges, which creates more visual depth once the map pieces are stacked into formation with what can be more than a dozen layers. Inabinett, a tall, Mohawked man, is the main artistic force behind Origin Artwork, though his wife, Karly, is also involved. When the business took off in early 2015—and Origin’s number of retailers soared from one to 30—Inabinett convinced Karly to quit her job as a hair stylist and join the business instead. “Quitting my old job was a tough thought at first, but there came a point where we had enough orders to keep both of us working full time and it made sense,” Karly says. The couple’s map offerings quickly expanded beyond local lakes. The husband-wife duo offer popular destinations like San Francisco, New York City and the Hawaiian Islands, as well as Tahoe-area favorites such as Squaw Valley, Echo Lake and the Town of Truckee. A mountain collection, to include Mount Rose, Pyramid Peak and Mount Tallac, each feature more than a dozen layers of birch to give a sense of elevation and shape. 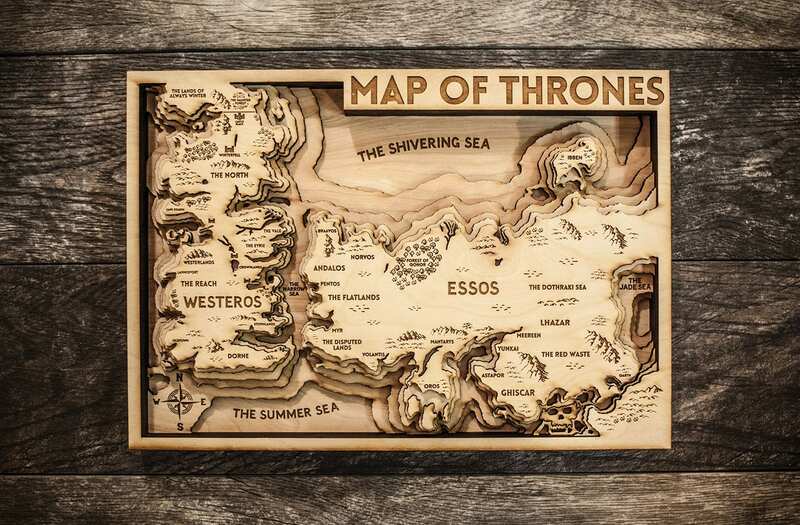 More whimsical locales include the Map of Thrones, a detailed take on the landscapes from the popular Games of Thrones series, where fans will see Westeros and Essos, as well as the specific castles, forests, seas and the Wall. A Harry Potter–inspired map of the Wizarding World centers around the Great Lake, with depictions of Hogwarts, the Forbidden Forest, Hogsmeade and even the Quidditch Stadium seared into the birch. Other offerings include Middle Earth from J.R.R. Tolkien’s Lord of the Rings series, maps inspired by Mario Kart (Inabinett also credits his love of maps to “obsessing over video game maps” in the 1990s) and even a three-dimensional map of Star Wars’ Millennial Falcon. Inabinett can also custom-create just about any piece a customer wants. Retailers in Tahoe include South Lake’s On Tahoe Time, Blue Wolf Studios in Kings Beach, Trunk Show and West Shore Market in Tahoe City, and Atelier and Bespoke in Truckee. “We mostly sell the Tahoe ones, of course, and San Fran,” says Anthony Marrone, co-owner of Blue Wolf Studios, a ceramics studio and gallery that features more than 40 local artists. Marrone says the studio has been experimenting with selling Origin’s mountain maps, but that the regular maps, depicting the places people live and visit, are consistently popular. Walker says that, at first, she wondered if customers would want blue in the artwork, but she found most people preferred the natural wood colors. “We call it our ‘RAW’ collection,” she says. Walker also sells some of Inabinett’s other pieces (the Game of Thrones maps, she says, sold out within three hours), including commissioned maps of Kirkwood and Heavenly. The Inabinetts visit Tahoe weekly to make their deliveries. Though Inabinett says he and Karly enjoy exploring new places, their go-to plan is to start in Truckee, then make it to The Lake in time for lunch at the West Shore Market, followed by a hike up Eagle Rock. After their South Shore deliveries, they head up the East Shore to catch the sunset from Sand Harbor, and will often cap off the day with dinner at the Lone Eagle Grille in Incline Village. When not working, the Inabinetts volunteer weekly with 40 to 60 students with special needs in the greater Sacramento region through an organization called Young Life Capernaum. “It’s seriously the most fulfilling thing ever and always gets us out of any small business stress that we may be feeling at any given time,” says Inabinett. The pair also make time to travel, particularly after the holidays when, Inabinett says, there’s a downtime of one to two months when small business owners like themselves can get away. 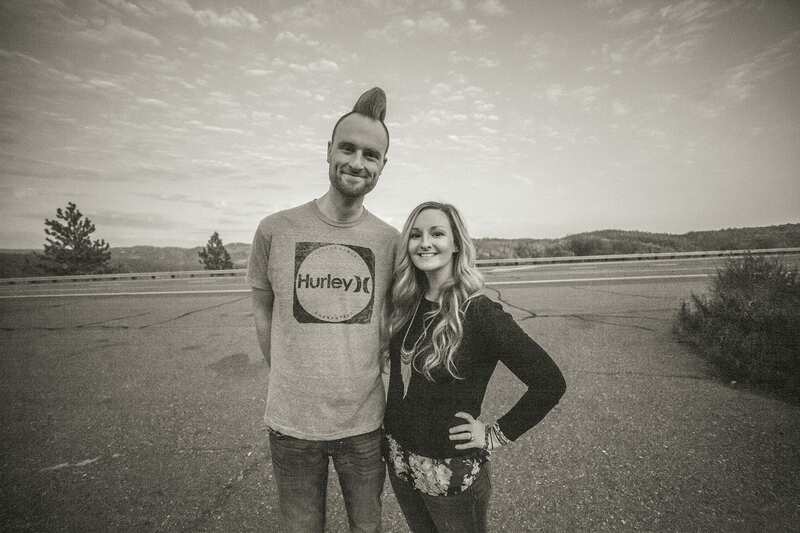 Last year, they visited China, where, Inabinett says, with his wife’s blonde hair and his height and Mohawk, they felt like celebrities due to the constant paparazzi. But, for the Inabinetts, travel is more than just a hobby. For a couple with a passion for maps, each journey is not just a new adventure, but a new opportunity. To see more maps or contact Joe Inabinett, visit Origin Artwork online at www.originartwork.com. Writer and editor Alison Bender lives in Reno with her family, www.alisonobender.com. In late 2014, around the same time that Joe Inabinett was forming Origin Artwork, Roger Floren was creating his own version of Lake Tahoe maps. Floren had moved from Bend, Oregon, to Alpine Meadows only a year or two earlier to work in the Squaw Valley technology department. In his spare time, he’d picked up odd jobs, like laser-etching champagne flutes for area hotels. Lasers intrigued him, and he experimented with using the medium to engrave wood, then layering wood to make mountains and other shapes. Floren’s distinct pieces are set off by the vivid blue—a custom-created color—he uses for water. 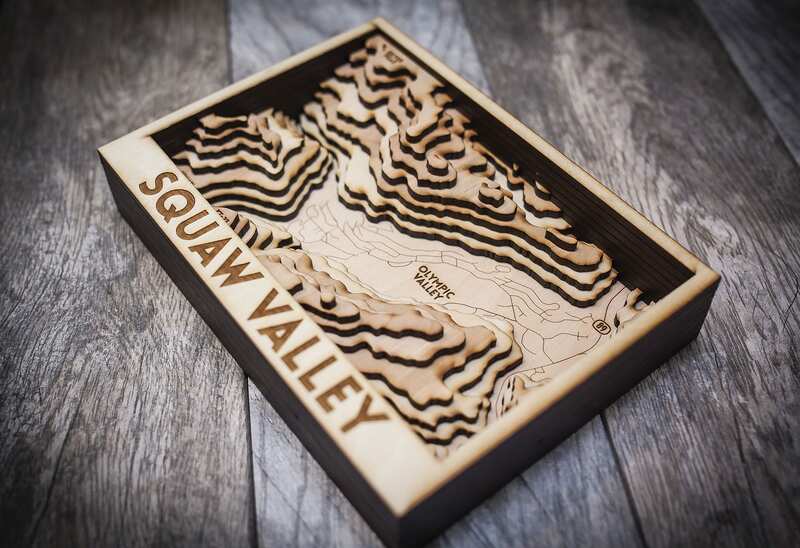 Today, Tahoe Wood Maps is based in northwest Reno and consists of six full-time employees. “Everyone plays a crucial role in making this company thrive each and every day,” Floren says. 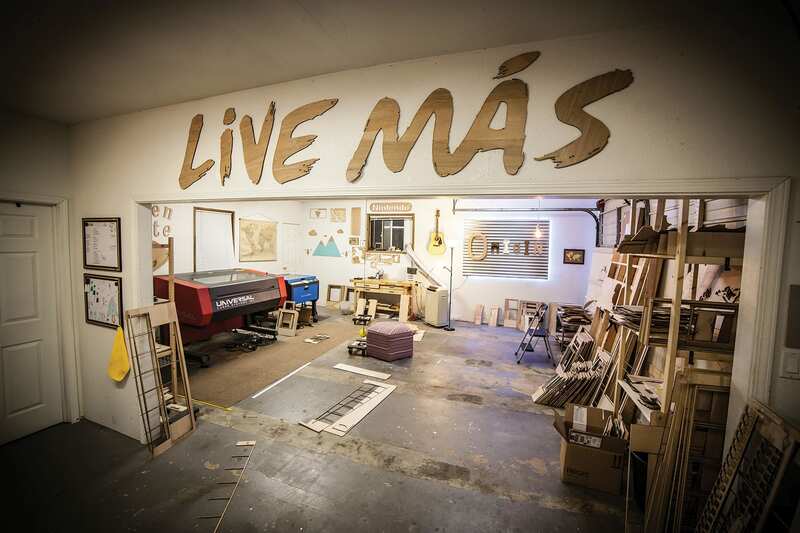 Working from the Artech makerspace—and with his two handmade lasers—Floren and crew cut, assemble and engrave each piece in-house. The detailed, three-dimensional maps are done to scale, showing the depths of Lake Tahoe, the many contours of the Grand Canyon or even the streets and neighborhoods of cities like Seattle, Portland and New York. 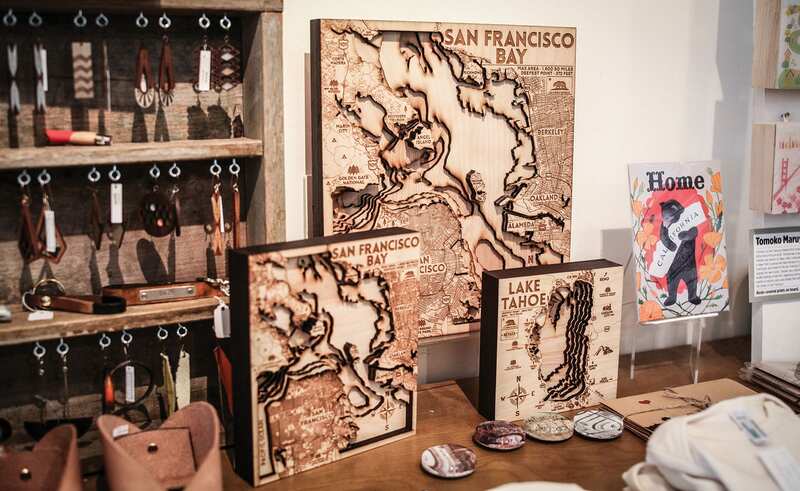 Tahoe Wood Maps was named one of USA Today’s top 10 best arts & crafts makers in 2017; in spring of 2018, one of Floren’s creations—a replica of the eponymous Burning Man—will travel to the Smithsonian American Art Museum in Washington D.C. as part of the Nevada Museum of Art’s City of Dust exhibit. Learn more about Tahoe Wood Maps at www.tahoewoodmaps.com; local retailers include Reno’s Nevada Museum of Art, Heavenly’s Pacific Crest Gallery and Incline Village’s The Potlatch, among others. I like the origin maps better.